Sunlit Pages: What I Read on Our Trip: Cinder, Lizzy & Jane, Inside Out and Back Again, Where'd You Go Bernadette? What I Read on Our Trip: Cinder, Lizzy & Jane, Inside Out and Back Again, Where'd You Go Bernadette? As we planned and packed for our Europe trip, one of my highest priorities was making sure I had enough books to read and enough variety that if something didn't fit my mood, I had more to choose from. As you might remember, Mike got me a kindle for Mother's Day specifically because of the upcoming trip, and I spent the weeks prior filling it up with titles from my to-read list. Although I'd done a little bit of destination-specific reading before we left, during the trip itself I just wanted books that were light and fun and that would strike the right balance between "easy to get lost in" but not "hard to pull away from." So no dense nonfiction but no gripping thrillers either. I fell in love with my kindle on this trip. This is the first e-reader I've ever owned, and I guess I'm admitting that I didn't know what I was missing before. I have much more to say about e-readers in a future post . . . I've compiled all the books I read into one post and tried to consolidate my reviews a bit so that this isn't too long. I'd love to hear your thoughts about any of these that you've read (or want to read)! As Mike and I were sitting on the plane at the very beginning of our trip, waiting for takeoff, Mike looked over at me and asked what my book was about. "Well," I started, "you're probably not going to believe it, but it's a Cinderella retelling" (insert indifferent nodding), "and Cinderella is actually a mechanic . . ." (insert raised eyebrows), " . . . and a cyborg" (insert a surprised guffaw, followed by my own hysterical laughter). That was Mike's reaction. When I presented the plot to my mother-in-law later on in the trip, her reaction was one of disbelief, disappointment, and sympathy. I think she couldn't believe I would waste my time on anything so ridiculous. And frankly, neither could I. In fact, during the first couple of chapters, I thought I was going to have to abandon it. I mean, did you hear what I said? It was about a cyborg-mechanic-Cinderella!!! You have to admit, that's a bit much. But I forged ahead, and after awhile, all the references to hovercrafts, technological interfaces, androids, and moon (Lunar) people (oh yeah, did I mention that?) didn't jolt me as much. I became wrapped up in the story: Cinder (the cyborg mechanic) lives in the city of New Beijing (this takes place years in the future after WWIV) with her stepmother and two stepsisters. A deadly plague has been slowly infiltrating earth and reaches New Beijing soon after the story begins. It shows no respect of persons: the little baker's son gets it, so does Cinder's youngest sister, and so does the king. Prince Kai is desperate to find a cure, but meanwhile, he is also trying to fend off attempts by Queen Levana, the Lunar queen, to build an alliance (through marriage) between Earth and Luna. Strange as I found it, I couldn't deny that the whole thing was extremely clever. The underlying fairy tale was always there, but it blended into the new story perfectly. And the characters were fresh and new if, at times, just a little stereotypical. Most of all, I appreciated that it was a young adult novel that I would actually feel comfortable giving to young adults. I hope the rest of the series stays as clean. It felt good to finally check this book off my list because it's been on there since it first came out in 2012. That was long before people were talking about it and the series became so popular. What grabbed my attention back then wasn't the synopsis (I don't think I even knew what the story was about), but that shiny red stiletto on the cover. In the years since then, I've heard other people, most notably Anne Bogel, remark on the ugliness of the cover and how it was a major turnoff for them, but for me, it was the thing that made me continue to come back to it, even though it didn't sound like anything I would like. It was just so different, and so is the story, so they actually go together perfectly. Katherine Reay's books have been mentioned several times on Modern Mrs. Darcy. They sounded like cute, clean, light books, so when this one came up as a kindle deal, I snagged it. It's about two sisters, Lizzie and Jane (yes, their mother had a deep love affair with Jane Austen and named them after the two oldest Bennett sisters) who were never close but became even more estranged after their mother died of breast cancer. 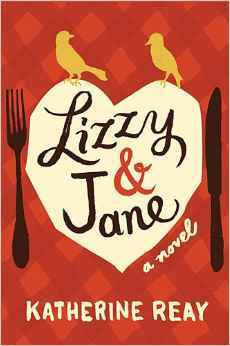 Fifteen years later, Lizzie (or Elizabeth as she prefers to be called) has her own restaurant in New York City, but it is floundering. Elizabeth just seems to have lost some of her creativity and drive, especially after she finds out that Jane has also been diagnosed with breast cancer. Hoping a break will help rekindle her passion for cooking, she flies out to Seattle to spend some time with her sister and help her as she undergoes treatments. Of course, when you've kept your distance from your sister most of your life, being forced to spend time together when you're both emotionally vulnerable is probably not the best idea, but that's what makes it interesting. For the first few chapters of this book, I thought I'd found a new favorite author: the story was interesting, the characters complex, and the writing better than average. But the longer I was in it, the less I enjoyed it. Elizabeth especially started to get on my nerves, mostly because she talked about food and cooking all the time. It was supposed to be endearing, like, Look how passionate she is! She can't even have a normal conversation with someone because she gets totally immersed in the subject of food and doesn't even realize who she's talking to. Luckily, handsome Nick thought it was adorable, but I was just thoroughly annoyed (although maybe that's how I am when it comes to books, so my apologies everyone!). There were some sweet sentiments about dealing with trials and pursuing your dreams, but in the end, I just couldn't make myself believe this story could have actually happened . . . and it wasn't even that unbelievable of a story, it was more just that I didn't connect with it. Still, it definitely kept my interest and was a great book for reading while traveling. Like Suzanne said in our most recent Book Blab, it wasn't so good that I was tempted to read it instead of watch the views out the window, but it was good enough that I was happy to pick it up when we had down time. So take that for what it's worth. I have yet to read a verse novel I didn't pretty much just swoon over. Whether that means I've been lucky enough to only read stellar ones so far or just that I actually don't what is good poetry and not, I don't know, but I'm adding this one to my ever-growing list of verse novels that I love. Although technically a novel, it is based on the author's own memories of growing up in war-torn Vietnam and making the decision to come to America with her family. The Vietnam War is not one I've read a lot about. In fact, I paused in the middle of reading to ask Mike, "So . . . why did we lose the Vietnam War?" After so much WWII history on our trip, I think I was just baffled that America could lose anything. It was a completely different war though, fighting against a different kind of enemy, and it's no wonder that tensions were so high because of it. Reading about Hà's experiences fleeing a country she truly loved and having to adjust to a totally new culture just made my heart ache. Refugees give up so much for the hope of a better life, and I am amazed by their bravery and tenacity. And it's true. How could you possibly refuse passage to someone when you know if they stay, their future will be doomed? She confesses to buying less pork so she could have a little money left over for fried dough. She confesses to making a little girl cry at school. She confesses to being the first one to touch the floor on Tết (an honor reserved for the oldest son). These were all events that had been introduced earlier, but now being reminded about them, especially in light of the taunting and insecurities she was facing at her new American school, made them seem especially pitiful and forlorn. "My child," says her mother, "how you shoulder the world." I think this ended up being my favorite book I read on the trip. The other books were fun to be in the middle of, but this one actually made a lasting impression on me. It was sweet and poignant and made me see things in a new way. I didn't know what to expect from this book. When I first heard about it a couple of years ago, I thought it must be a funny book. Then, more recently, someone else was talking about it, and it sounded more like a serious book. But here's what I found: the plot line itself is rather heavy (Bee's mother, Bernadette, is psychologically unstable and something of a recluse; when things fall apart, she disappears), but the writing itself (witty, smart, funny) kept everything light. So depending on how you look at it, it could be either . . . or both. 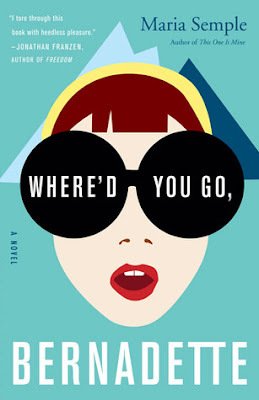 When the novel opens, we know Bernadette is gone, but we don't know why. Told through 15-year-old Bee's eyes, as well as email exchanges, report cards, invoices, school notices, and doctor's bills, the evidence gradually stacks up and we're able to form a clearer picture of why Bernadette bolted, where she might have gone, and who she really is. I don't know if I've ever shared the Goodreads plot summary in one of my reviews (I kind of pride myself on writing my own), but its description of Bernadette is just so perfect that I can't help myself: "Bernadette Fox is notorious. To her Microsoft-guru husband, she's a fearlessly opinionated partner; to fellow private-school mothers in Seattle, she's a disgrace; to design mavens, she's a revolutionary architect, and to 15-year-old Bee, she is a best friend and, simply, Mom." Even though this didn't end up being my favorite book from the trip, it was definitely the one that captivated my interest the most. In fact, on the flight home, Mike asked me if I wanted to watch a movie with him, and I somewhat sheepishly admitted that I didn't know if I could pull myself away from my book. This had to do, in large part, with the writing (as mentioned before, it's just so sharp and smart) and the way the book was set up (I love it when the story moves from the end back to the beginning, and I have to put the pieces together), but also, it was because of Bernadette. As you can probably tell from the above quote, she was just an absolutely fascinating character. Unfortunately, the ending got just a bit melodramatic for me. I wasn't unhappy with the way it ended, but getting there felt a little crazy (but then, the whole book is actually a little on the crazy side, so I shouldn't have been surprised). It would be remiss of me not to give you a little taste of Maria Semple's writing, so I'll leave you with one of my favorite passages, a description of icebergs (Antarctica plays a big part in the story): "White, yes, but blue, too, every blue on the color wheel, deep like a navy blazer, incandescent like a neon sign, royal like a Frenchman's shirt, powder like Peter Rabbit's cloth coat, these icy monsters roaming the forbidding black." This book is one that really can't be replaced by a summary or a book review. It's very much about the journey, and the only way to get there is by reading it. Have you read any of these books? I'd love to hear your opinion! I have read Cinder and the rest of the series, and yes it stays just as clean and enjoyable. I agree that premise is a little crazy, but it really was refreshing to see a different take on a Cinderella story. And it really isn't amazing writing, but it is fun. The introduction of new characters in the other books is great. And I love the way she weaves the fairytales together. I haven't read the others, but I will add them to my list! Oh, I'm SO glad to hear they stay clean! We need more series like that! I haven't read LIZZIE & JANE, but I have read Reay's DEAR MR. KNIGHTLY. I liked it okay, but it seems I felt the same way you did--the main character irritated me the further I got into the book and while in the end I saw changes and progress in her personality, I didn't have a desire to read more Reay. I think the thing to know about me is that I don't read a lot of fantasy or science fiction, so I think that's why it was so hard for me at the beginning. For readers who are already fans of either of those genres, the first few chapters won't be so difficult. But yes, I loved seeing which elements of the Cinderella story became a part of this one. Good to know about Dear Mr. Knightly. And thanks for the verse novel recommendation. If you haven't read The Crossover or Brown Girl Dreaming, I would HIGHLY recommend them. Haha, your reaction to Cinder was exactly mine: "A Cinderella, who's a Cyborg mechanic? In future Beijing?" Totally weird premise, but it absolutely works. I know you have trouble finishing series, but I do recommend the rest of the books, they are all equally delightful. Also, in my opinion Dear Mr. Knightly was better than Lizzie & Jane, but still had its issues (not necessarily essential reading, but a decent one if you ever happen upon it). If I'm in the right mood for it, I think Dear Mr. Knightly could be just the thing. I read Inside Out & Back Again, but I'm allergic to verse novels so I didn't enjoy it as much. I reluctantly picked up another book by Lai and was pleasantly surprised to find it wasn't in verse, and the bratty main character eventually grew up enough that I liked the book. The Cybils poetry finalists had a few verse novels in them. I bet you'd like Full Cicada Moon. I remember you've said before that verse novels just aren't your thing. The more I read them, the more I realize that I guess they ARE my thing. Who knew? So thanks for another one to add to my list! 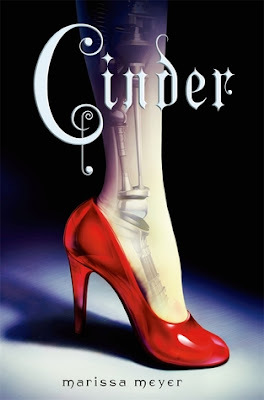 We're reading Cinder for book club this month (this book club is so much different than ones I've been a part of in the past! ), and I had to laugh when you described everyone's reactions to it! It does have some interesting plot features, and I love how clean it is. I'm interested to hear about your book club discussion! Although it was a fun book, I didn't find myself dying to talk to someone about it, like I do with some books (in other words, it didn't scream, BOOK CLUB BOOK! :-)). "This book is one that really can't be replaced by a summary or a book review. It's very much about the journey, and the only way to get there is by reading it." I completely agree! That said, I'm not sure I'm glad I read Where'd You Go..! HA! I liked it--it definitely kept me guessing-- but I'm totally with ya on the ending; it didn't do it for me either. I think if the ending would've been better, I may have liked the book more? And I've been meaning to tell you--I LOVED your podcast with MMD!!! :) HOW FUN!!! I love, love, loved it. And thank you! It's been so fun to hear from friends who listened to it! 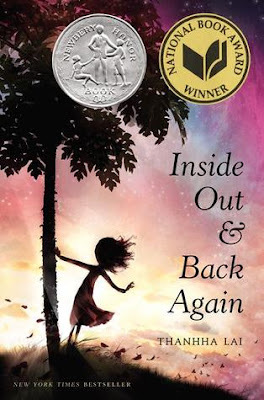 Inside Out and Back Again is on my list to read very soon! I really liked the whole Cinder series. Each of the other books in the series focuses on a different character and brings in a different fairy tale, (while still giving glimpses of the others), until the last weaves them all together. I did not like Where'd You Go, Bernadette? as much as I thought I would. Mostly because I didn't like her as a character. I just became increasingly more frustrated with her as time went on. Isn't it nice to have time to read?! :) Glad you're back safe. How many of the Cinder books have you read? From what I can tell, it looks like there are four main books in the series, with a bunch of novellas interspersed throughout. Is that right? I have read all 4 of the main books and none of the novellas. Of the ones I've read, Winter (#4) was my favorite--Cinder was a close second--and Scarlet (#2) my least favorite. That's so great, Erin! I'm glad she had already discovered them, and how fun that she has her own blog! Aw thanks for leaving her a comment Amy, she doesn't have many visitors, so very special.